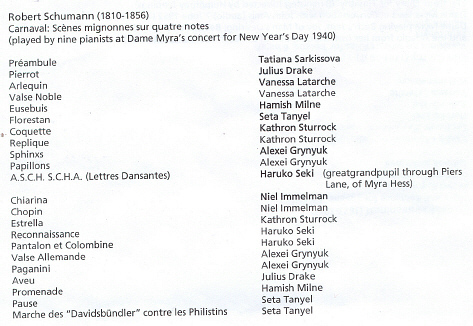 From the first those concerts were over-subscribed, and so were today's three free recitals, organised as a special tribute to Dame Myra Hess and to mark 350 years of British Jewish Life since Jews were allowed back into our country after centuries of enforced exile. Myra Hess herself was to be seen playing in a special screening including film clips available on Beulah DVD YB35. Dame Myra's pupil Prof. Piers Lane of the Royal Academy of Music introduced the concerts, the first reflecting the calm and 'spirituality' Londoners sought and found through music in the National Gallery (bereft of painings) at the time. Her pupil Yonty Solomon gave a performance of the Goldberg Variations played con amore and con molto pedale which sounded suitably old fashioned, but was gratifyingly free of rhythmic indulgences. To characterise it, think of Glenn Gould; the complete opposite in every way. The audience - gathered in the same domed gallery space as for those wartime concerts - relished its quiet concentration, as would have those in the Forties. Rarely can an account of Schumann's 'Carnaval' have been so totally engaging (unless when played by nine pianists at Dame Myra's New Year's Day concert 1940). Thanking the nine distinguished pianists afterwards, Piers Lane (pupil of Yonty Solomon) reminded us all how challenging a task it was to play just one of the Scenes mignonnes without opportunity to warm up or time to settle down. Some of the pianists may not hurry to hear the souvenir recording made of the concert, but the audience took the inevitable little mishaps with benign indulgence! Notably unblemished survivors of the ordeal were Julius Drake (accompanists are practised in coping with instant emergencies), Hamish Milne (secure and expressive in Eusebius and Promenade) and the Japanese pianist Haruko Seki (greatgrand pupil through Piers Lane of Myra Hess), for me the star of the afternoon. To finish they let their hair down in Rachmaninoff, Chaminade and Czerny, fitting six and eight hands, and three and four piano stools, at the keyboard. A fascinating afternoon and a nostalgic reminder of those life-enhancing concerts during the War. It has been a pleasure to renew acquaintance with Myra Hess's own playing of Carnaval on a newly released broadcast recording from 1950 (BBC Legends BBCL 4201-2). Jeremy Siepmann says that she never liked the microphone, and finds here uneasiness occasionally evident; maybe, but far less so than that of those who commemorated her by sharing Carnaval at the National Gallery in September. The CD has her still impressive Haydn (Sonata in Eb Hob XVI:52) recorded after her stroke, and her beloved Bach (English Suite No 2 etc).